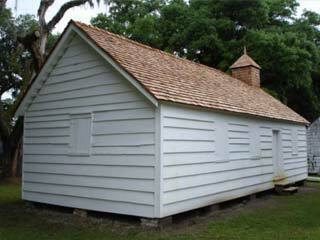 March 15, 2006  Mansfield Plantation is committed to the preservation of our distinct history. 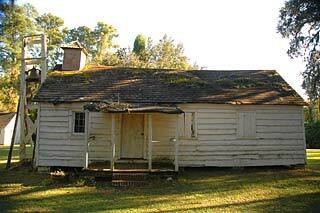 We believe that the structural enhancements to the slave chapel will help prolong the life of this beautiful church indefinitely so that generations from now, people will still be able to step back in time as they walk through an authentic, antebellum slave chapel. 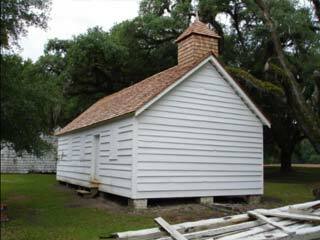 The work on the Mansfield Chapel is being done by Tommy Graham of T. W. Graham Restorations of McClellanville, SC, under the direction of an Outbuilding Preservation Plan developed by Glenn Keyes Architects of Charleston, SC. 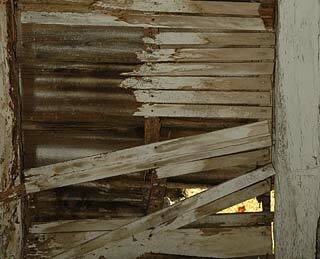 After 200 years of wear and tear, the slave chapel at Mansfield Plantation was beginning to show signs of damage and decay. From hurricanes and fires to insects and abuse, this centerpiece of Mansfield's distinct history was in need of help. 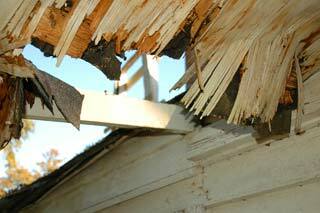 The roof was in bad shape, giving mother nature easy access to the inside. 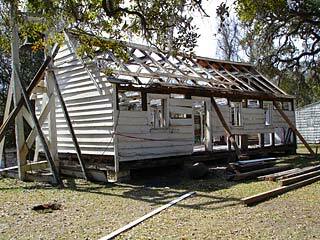 Rot and decay were destroying the original structure from the inside out, and it was only a matter of time before the building would fail altogether. 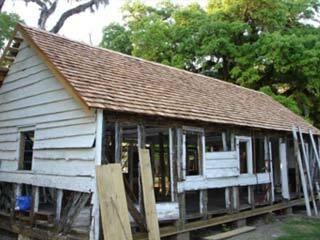 In March of 2005, a massive project to resurrect the slave chapel was begun. 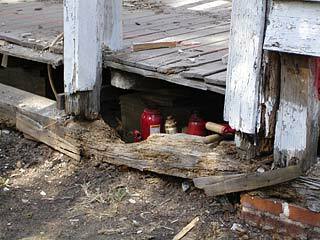 Hydraulic jacks are being used to support the foundation, so that everything salvageable can be utilized for generations to come. 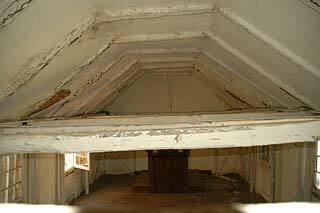 Steel cables provide additional support from the inside so that the walls do not collapse. 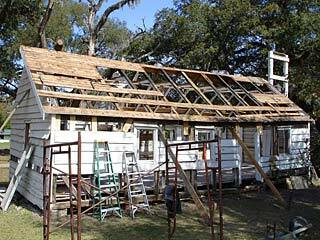 Elaborate beams, trusses and scaffolding is also in place for maximum protection. The new roof beams are now in place. 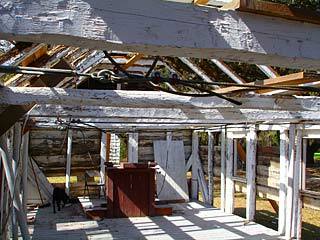 Soon, an authentic cedar shake roof will once again provide shelter for this amazing slice of American history. 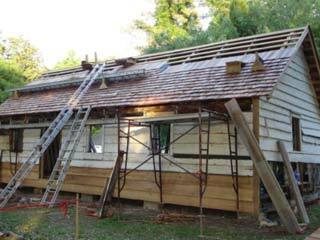 Applying the cedar shakes to the roof. 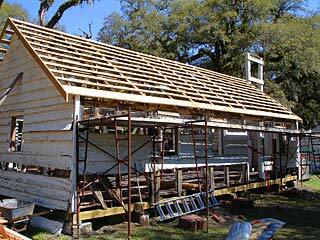 A brand new cedar shake roof should last another 200 years, just like the original. 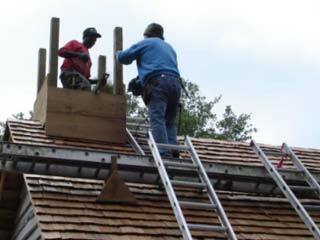 Carpenters build the frame for the steeple. The whitewashed walls are back to their original glory! All that is left is reassembling the original bell tower. and come see us at the Mansfield Plantation Bed & Breakfast! The Dr. Francis S. and Mary L. Parker Foundation, Inc.
or call 843-546-6961 (toll-free 866-717-1776) and ask to speak with Kathryn Green. New Photocard® prints available in our online store! Email them to frends or frame your favorite Mansfield scenes! 20% of this purchase is donated to the Francis & Mary Parker Foundation. 10 hand-wrapped, photo-postcards. Full color front with caption and history on back. Suitable for mailing or framing. Approx. 8.5" wide x 5.5" tall each. Join the Mansfield Plantation Bed & Breakfast Club © 2004–2017 Mansfield Plantation Bed and Breakfast. All Rights Reserved. gift cards, artwork and collectibles.